The Missionary Apostolate of the Sick is an initiative of the Pontifical Missionary Works. It reaches out to all the sick, disabled, elderly, lonely and abandoned – those who suffer in the body or soul and those who care for the sick. As part of the Apostolate, everyone can transform suffering into a gift for the missions. – the suffering person prays for missionaries and for spreading the Kingdom of God on earth. – spreading the missionary concept of the Church and the Missionary Apostolate of the Sick in their environment. The Missionary Apostolate of the Sick – How do I join? 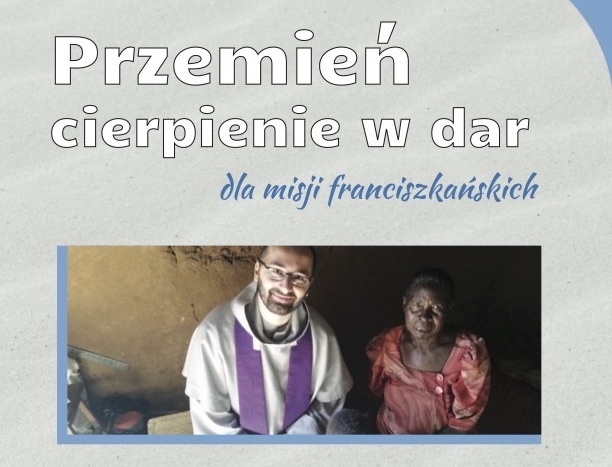 If you are interested in joining the Missionary Apostolate of the Sick, please send an email to misje@franciszkanie.pl . Copy and paste this phrase into the subject line of your email: ‘Przemień cierpienie w dar’ (i.e., ‘Transform suffering into a gift’). Your message should express your desire to offer up your suffering for the intentions of the missions. To get a Polish-language leaflet about the Missionary Apostolate of the Sick, please include your postal address. Copy and paste or write ‘Przemień cierpienie w dar’ in your note. God our Father, in difficult situations and in illness give us strength, that we may unite our sufferings and our infirmity with the Cross of Christ. In full trust, we ask you: do not let us forget that you are with us. Grant that we will not fall into doubt if we have to wait a long time for your answer. Through our spiritual bond with missionary sisters and brothers, give us strength and comfort us with your closeness to all the sick have not found human help. Grant that through our sufferings we may ask for an increase in faith and love for people all over the world. Call many young people from all nations to your missionary ministry. Best of Fathers, we trust that in your kingdom all tears will be wiped away, and there will no longer be death, sickness or suffering. Be with us on our way to you. Amen. Poprzedni Previous Post Surround the Missionaries with Prayer!